This review first appeared on Jan. 6, 2017 at AllAboutJazz.com. For most of us in the United States, mentioning “Brazil” in a musical conversation connotes bossa nova or samba  which is a bit like describing all American music as blues or country. Expertise in the music of Brazil is the work of a lifetime; much as with the United States, each region has its own style, its own traditions. And modern urban centers have given rise to nonregional styles as well. None of this means we have to be experts to enjoy listening to Brazilian music  which, in its emphasis on improvisation and often the instrumental makeup of its bands, draws on many of the same strains as jazz. Enough to sound familiar to American ears, anyway. 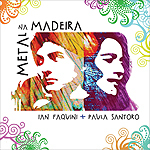 The new album by Brazilian-American guitarist Ian Faquini and Brazilian vocalist Paula Santoro is a nice acoustic-vocal pairing that inhabits much the same territory as Ella Fitzgerald’s recordings with Joe Pass. On some cuts, Vitor Gonçalves’ accordion lends a smokey café ambience to the music, lending a touch of French chanson or Argentinian tango to the mix. The horn and reed section of Spok (saxophone), Jeff Cressman (trombone) and Harvey Wainapel (reeds) is more subdued in the mix, adding occasional texture but never interfering with the stripped-down approach of the album. Similarly, the rhythm section of bassist Scott Thompson, drummer and percussionist Rafael Barata and percussionist Sergio Krakowski creates a foundation in an unobtrusive fashion. Throughout the nine tracks here, the focus remains on Santoro’s goregous singing and Faquini’s tasteful guitar. The songs are all composed by Faquini, and according to the release notes draw on a variety of Brazilian traditions from the northeastern coast  styles unfamiliar to this listener: Maracatu, Frevo, Baião, Xote, and Toada. It’s close enough to Brazilian jazz and bossa nova, though, to be accessible from the opening track, “Sereia”  an uptempo song that manages to be sunny and yet restrained. “Dorival Pescador” starts with Faquini’s acoustic guitar sounding a bit like a lost vintage Seals & Crofts song before Santoro joins in on vocals. Gonçalves kicks off “Jerimbamba” on accordion  which elevates the energy from the first two tracks. Santoro then takes the reins and runs with this almost aggressive tune. “Vasta Ilha” goes downtempo before the title track lifts the energy again, with the horns providing bright punctuation to Santoro’s cheery vocals. “Mae Da Lua” is almost a dirge, with Gonçalves’ accordion providing a heartbreaking sadness behind Santoro’s sad tale. The three closing tracks keep the last half of the album in a very restrained mood. Faquini is a gifted guitarist, and if none of his songs grab with a great melodic hook, all are interesting enough to provide Santoro a worthy canvas for her singing - and the other musicians to elevate their playing as well. It’s a listenable, interesting album, likely of interest to fans of Brazilian and acoustic music.